This item was perfect for our Bulldog club auction. Bulldoggers loved it and it got a lot of attention at the show. 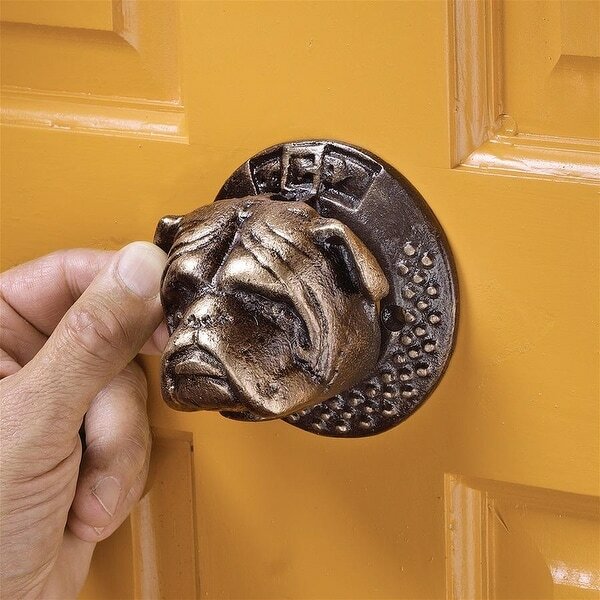 What&apos;s better than our 19th-century replica antique Bulldog door knocker to welcome your guests without a "bark" nor a "bite"? Cast from the original antique British molds using the ancient sand cast method to capture each detail, our Design Toscano-exclusive, authentic foundry iron casting is sure to impress with resonant knocks that make grand statements on front doors. From spiked collar to lovable eyes, this friendly bulldog door knocker is as fun as it is functional and makes an enviable housewarming gift. Finished in aged iron with gold highlights, it comes complete with built-in strike plate. Hardware is not included.4"Wx3"Dx3"H. 2 lbs.